Multinational corporations are luring millennial workers with empty promises and self-serving slogans. I still have the red lanyard I wore at the “Business Fights Poverty” conference at the University of Oxford’s Saïd Business School last summer. The badge asked me to write my name on the front, and, on the back, state the “purpose that drives me” and the “people I need.” The idea, a conference organizer later explained, was that together, the guests—a mix of businesspeople, development workers, and NGO staffers—would “unlock opportunities for social impact.” With its Davos-style platitudes and its TED-inspired evangelism, the conference exemplified the corporate credo that economic inequality can and should be solved by innovative market solutions and compassionate millionaires. Here, inequality is not the outcome of power imbalances, with traceable roots and political structures, but an ahistorical “challenge” just waiting for thought leaders to fix it. Business Fights Poverty (BFP) is the world’s largest business-led network of companies, non-governmental organizations and aid organizations working together to “embed purpose in business,” as the company puts it. With a team of over a dozen “challenge managers” and “thought leadership directors,” the business of London-based BFP is to amplify a doctrine that some CEOs have been pushing for a while now: that a new and more humane kind of capitalism is underway, in which big business is driven as much by “purpose” as by profits and delivers as many “social returns” as it does financial ones. Under this “purpose paradigm,” doing what’s right for society is perfectly compatible with what’s right, commercially, for the corporate bottom line. With so many governments failing to protect their people from poverty, exploitation, and climate catastrophe, the logic goes, market solutions—led by ethical, trailblazing CEOs with the support and trust of pragmatic nonprofit partners—are humanity’s best hope to alleviate poverty, inequality and toxic political climates. The Saïd Business School was a fitting venue for such an endeavor: With its slick lobby, its TV screens at every corner and a glass wall facing the street, it looks more like a management consulting firm than a university. Most panel discussions and presentations that day took place in the Nelson Mandela Lecture Theatre, a large hall with a broad podium directly adjacent to the lobby. As I waited for the lecture hall’s doors to open and the conference to kick off, I took a seat on one of the burgundy couches close to the window. Here, my eyes fell on a set of brochures advertising some of the school’s courses. Only one program explicitly promised students commercial success; all the other programs emphasized the positive social impact graduates of the program could make with their degrees. The school wasn’t pitching profits. It was promising graduates purpose. The school’s MBA program, for example–a one-year full-time course with a price tag of £57,200 ($75,804)–trains students to apply business skills to complex social problems, restore trust “in institutions and each other,” and prepares them for overall “purposeful careers.” Its executive courses in Impact Investing and Social Finance pledge to equip professionals from workplaces such as USAID, Morgan Stanley, the European Investment Bank, and Oxfam—portrayed as perfectly natural collaborators—with the confidence, leadership skills, and practical tools they need to fight poverty, “make successful deals” and “deliver financial, environmental and social returns” on a global scale. These courses only take five days, but don’t come cheap; participants are expected to pay £6,000 ($7,637) for tuition alone. The price tag is indicative of how profitable poverty can be, if fought the right way. Branson’s book is part of a bulging genre of business media and literature concerned with the question on how to attract millennials to corporate jobs through purpose. This genre now includes TED Talks by finance professors; LinkedIn Studies; business articles on news sites like the BBC and The Telegraph; and leadership columns and recruitment-advice pieces on websites such as Forbes. And the millennial laborer is a “stakeholder”—an intentionally vague term used to obscure power relations between social groups—to be reckoned with. In the United States, millennials made up 35 percent of the workforce in 2017. By 2025, they’re expected to represent three-quarters of the workforce. Globally, one in three workers will be a millennial by 2020, according to the Financial Times. A raft of surveys, articles, and polls suggest that the millennial generation, which came of age during the financial crisis, is skeptical of big business and market solutions. It tends to favor a stronger role for governments, disapproves of tax cuts for the rich, likes trade unions more than their parents do, and feels more sympathy for socialism—which it associates with equality and fairness—than for capitalism. These polls and surveys about millennial anti-capitalist angst are the foundation of the corporate-purpose zeitgeist, which seeks to win the trust of the millennial and channel her radical energies along market friendly lines. Contrary to its purported aim, the point of purpose isn’t to drive change. It’s to make sure any change stays within the tightly bound comfort zone of the world’s most powerful executives. During a visit to Columbia University, my alma mater, in New York City last fall, I learned that here too, there was no escaping purpose. Right outside the entrance of Butler library, I encountered a small but colorful company stand by CLIF Company, tempting students to confide our “purpose in life” in exchange for a free protein bar. For corporate managers, it takes hard and smart PR work to build an ethical, purposeful corporate reputation—which, if mismanaged, can implode within a matter of days. For Mark Zuckerberg, who has gone out of his way to portray Facebook as a company that’s driven by a social mission to do good for the world, 2018 was a terrible year. The seemingly endless stream of ethical scandals that have dogged Facebook since the Cambridge Analytica scandal broke in the spring has left Zuckerberg’s depiction of Facebook as a social enterprise in tatters, which—on top of falling stock prices—seems to be taking its toll on its appeal as an employer too. Purpose is as much about retaining millennials and keeping their trust as it is about recruiting them: The professional services firm PricewaterhouseCoopers employs a “Chief Purpose Officer” to monitor the values of its workers, especially millennial workers, to make sure that they’re in sync with the company. It’s in this deliberately tone-deaf McKinseyism that we see the essence of the purpose project at work—namely, to deflect attention away from the fact that corporations are driven by a compulsion to place profit before anything else and to do “the right thing” only when it benefits the bottom line. The same outlook marked most discussions that I watched and took part in at the conference in Oxford, where any attempt to broach topics like corporate tax evasion, lobbying, and supply-chain exploitation were either ignored or dismissed as “negative.” When, during a panel discussion in the afternoon, an NGO worker tried to steer the conversation toward root causes of economic inequality, a tall, middle-aged Unilever manager sitting next to me raised his hand and shouted, with tangible annoyance, that NGOs—his supposedly equal partners—“should stop talking about theories of change but [instead] focus on practice of change.” The impatience of the Unilever manager with such “theories” typifies the purpose project’s refusal to go beyond vague optimistic slogans and ahistorical branding fantasies. 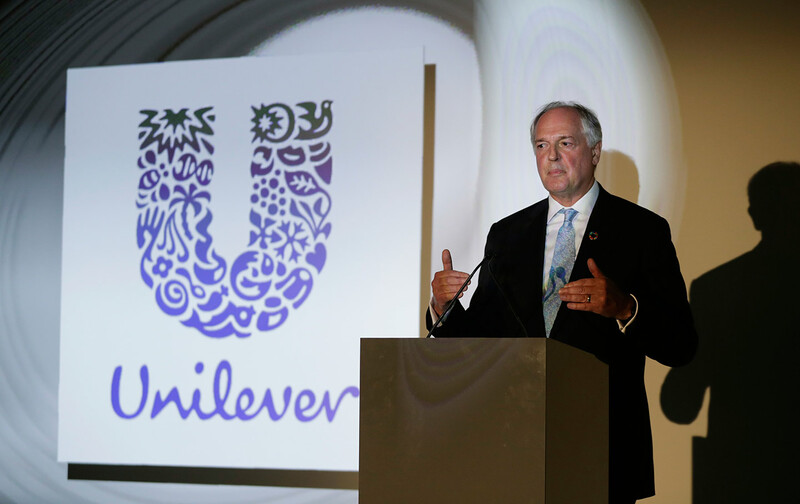 No executive embodies the promise of “purpose-driven” capitalism as well as another Unilever manager: Paul Polman, a 62-year-old Dutchman who, as he likes to tell the media, considered priesthood before entering business. After 10 years at the rear at Unilever, Polman retired at the end of last year. His company, headquartered in both Rotterdam and London, is known for household brands such as Dove, Knorr, and Lipton Tea. As the world’s largest buyer of palm oil, Unilever has also partnered with NGOs to set up voluntary certification schemes to minimize risks of labor exploitation, forced labor, and deforestation at palm-oil plantations. Again, these come without external oversight or transparency of regulation. Purpose, after all, is the stuff of trust and collaboration: it comes from within. And trust he has. As a result of his success in “embedding purpose” in Unilever’s products, and his repeated calls on fellow CEOs to demonstrate the same “sense of morality” as Unilever, the Financial Times dubs him “a flag bearer of corporate sustainability” with “a tendency to preach,” and he’s gained praise from influential women’s-rights groups, including UN Women, for his fight against sexist stereotypes in advertising. He’s pocketed many prestigious global-leadership awards the past years, such as the United Nations “Champion of the Earth” award. Polman’s reputation as a “purpose-driven” CEO has landed him in leadership and advisory positions at major business councils, employer organizations, and even the United Nations, where he’s advised two secretaries general on ethical—and crucially, self-regulated—business practices and poverty alleviation. He’s turned this logic onto his employees too. According to Polman, Unilever attracts nearly 2 million applicants every year. In 2014, he told an interviewer from McKinsey that workers engagement and motivation at Unilever had soured since he took over as CEO. Today, a “remarkable 90 percent of employees” express pride in working for Unilever,” notes the company’s latest annual report. Polman understands that, unless the private sector “lifts its purpose” to Unilever’s level, the “millennial challenge” might jeopardize the industry’s ability to attract the best and brightest people. “Seventy-five percent of graduates of US universities don’t want to work for big corporates anymore,” he told an audience of corporate executives in London in 2016. “They just don’t feel it’s cool,” he added at Stanford. The desire of this generation to “make a difference in life” and work for organizations with “a strong social purpose” is “a big challenge in many companies,” Polman told students, because “trust is low in business and trust in CEOs is even lower.” Solving this “challenge’, from his perspective, means that Unilever-like capitalism, while an outlier today, must soon turn into the norm. In reality, a Unilever-like capitalism is fundamentally ill-equipped to bequeath the economy with the conscience that young people are demanding. Polman’s own actions in 2018 show us why. Compared to the warm bath that business schools and UN offices have been for Polman, in his own country, the Netherlands, he’s been dogged by cold showers. It all started on 10 October 2017, when the newly formed Dutch government announced the scrapping of the Dividend Withholding Tax (Dividendbelasting), a tax paid by shareholders in Dutch companies over the dividends they receive. None of the ruling parties had mentioned the tax scrap—which would cost the Dutch treasury an estimated 2 billion euros every year—in their election manifestos, so the measure came as a huge surprise to the electorate. But not to Paul Polman, who viewed the tax scrap as a sign of progress and, as it would turn out later, had fiercely lobbied the government in The Hague to make it happen. It might have helped that the Dutch Prime Minister, Mark Rutte, had been a Unilever manager for over a decade. In defending the tax scrap, Rutte framed the measure as being in the national interest, necessary to attract and retain multinationals. Leaving the tax intact, he argued, would be irresponsible, as it would risk losing multinational businesses to the UK, where shareholders don’t pay tax over their dividends. Save for a handful of business leaders, most people found Rutte’s case unconvincing. “There is no evidence that this costly measure would benefit the Dutch economy. It is mainly a gift to foreign governments and some foreign shareholders,” Bas Jacobs, a professor of public economics at Erasmus University in Rotterdam said, in a phone call. Moreover, it could contribute “to widening the gap between capital and labor, between rich and poor.” Even Rutte’s coalition partners, aware of how deeply unpopular the measure was, couldn’t convincingly defend the measure. Going along with it anyway, one of them told the press, felt like “swallowing a melon.” A poll carried out in early September 2018, when the “D-word” had dominated Dutch politics for nearly a year, showed that only 11 percent of the population supported the tax scrap. During these months, Polman’s role as the leading lobbying force behind the measure had come to the fore. Internal memos from the Ministries of Finance and Economic Affairs, obtained through Freedom of Information requests by academics and journalists, revealed that Polman had all but promised the government to reward the tax scrap by moving its London headquarters to Rotterdam. When opposition leaders accused Rutte of allowing himself to be blackmailed by Unilever (and of behaving like “the errand boy of Big Capital,” to quote the leader of the Dutch Socialist Party) and insisted that the relocation of Unilever’s London office to Rotterdam could not possibly be worth 2 billion euros annually, Rutte fired back that dodging the tax was not about the wishes of one company (i.e., Unilever). It was Polman and he had bad news: Unilever’s shareholders had rejected his plan to move to Rotterdam, leaving Polman unable to fulfill his part of the tax deal. A few days later, Rutte announced that the Dividendbelasting would stay, after all. But it wasn’t just the political opposition or falling approval ratings that had caused Rutte’s U-turn; it was Paul Polman. Never before had the influence of big business over Dutch politics been so out in the open. And never before had Rutte suffered a credibility crisis this dramatic. When pressed in an interview late November, Polman admitted that he had pushed for the move to Rotterdam because “we [at Unilever] do what’s good for the company.” His comment proves what the purpose paradigm so zealously denies: that CEOs—never mind their individual character—can and will exacerbate inequality and fuel toxic politics when it benefits their bottom line. Just a week before Polman sent Rutte that early-morning text, the central tenet of the purpose paradigm—the idea that doing good is good for business—had already blown up in front of Polman’s eyes during a debate between Polman and journalist and author Anand Giridharadas in New York City. The debate was hosted by the Unilever-owned condiments producer Sir Kensington’s and moderated by Quartz At Work editor Heather Landy. In the debate, Giridharadas, whose new book Winners Take All, the Elite Charade of Changing the World warns against corporate-led change initiatives, challenged Polman on his optimistic claims about the potential of business and market forces to drive progressive change. Thirty-four minutes in, he took out his phone and told Polman he’d offer him the “opportunity to make history” and back up his purpose talk with action. What he showed him was an advertisement of the product Fair & Lovely, a skin-whitening cream by Hindustan Unilever that targets girls and women primarily in India with an unmistakable message of white superiority. Telling the story of a young Indian woman whose life, career, and family relations went from miserable to successful after she started using Fair & Lovely, the ad directly clashes with the aims of Polman’s Dove product line, which claims to boost the self-esteem of millions of women through advertising and self-esteem workshops. When pressed by Giridharadas to condemn the ad and take the product off the market, Polman refused, arguing that it “wouldn’t solve the problem,” since other companies would simply take over their market share. When even the most “ethical” CEO feels compelled to capitalize on and actively entrench white supremacy when the market presents him that opportunity, it’s a sign that the Purpose Paradigm really only knows one winner. Instead of admitting that his “win-win” claim is a corporate fantasy, Polman called Giridharadas’s tactic counterproductive. Dismissing the Fair & Lovely paradox as a “micro issue,” he urged the journalist to “focus on the bigger picture” and “think of global systemic solutions and collaborations that focus on how companies compete at a global level” and move it “to a higher level of operating.” That, Polman said, is what drives him and why he lives “in a solution space” rather than point fingers. To fully grasp the emptiness of Polman’s insistence on “systemic solutions” and “global collaboration,” it’s worth a look at the UN Human Rights Council in Geneva, where for a week in October, a coalition of governments, trade unions, civil-society groups, and feminist organizations gathered for the fourth time since 2014 to push for exactly that: a new global instrument to raise corporate standards to a higher level. Rather than depend on corporate goodwill, the instrument has the potential to overturn “the state of impunity that has relied on the good will of corporations to make amends,” notes the Association of Women’s Rights in Development. Neither Unilever and Polman weighed in on the proposed treaty; Unilever did not answer four e-mails inviting the company to share its views. But the International Chamber of Commerce (ICC), which Polman chairs, has actively lobbied against the treaty. Why? Because the purpose of the treaty is to turn unenforceable, voluntary self-regulatory initiatives of corporations into legally binding obligations. Proponents of the treaty want it to regulate “in international human rights law, the activities of transnational corporations and other business enterprises” and to promote international cooperation between governments to limit the power that corporations now have over states. The ICC, on its part, has warned that actually enforceable rules would be a “big step backwards” and jeopardize the “huge success” made under self-regulated corporate initiatives. A six-month long investigation into Unilever’s supply chain in 2017 by five millennial journalists from Investico, a Dutch platform for investigative journalism, did not find evidence to back up Unilever’s leadership claims either. At the five certified palm-oil plantations that they visited in Indonesia, as part of the investigation, the team encountered the same environmental and labor violations that are known to be pervasive among non-certified plantations. In India, they found that Unilever’s solution to people’s limited access to soap—namely, to sell soap in small, cheap mayonnaise-size sachets—was causing plastic wastage and pollution problems. “They claim that there’s no trade-off between profit, people, and planet, but in our own research, that’s where we definitely hit a wall with them,” he added. I left the Oxford conference well before the closing session ended, and on my way back to the train station, I took off my lanyard. Even though I’d left the “purpose that drives me” field blank, I don’t think I was all that different from most of the other guests, who’d filled it in with the cause of their choice. We were all there because we wanted to see an end to poverty and exploitation; it was the conference, and the purpose paradigm it represents, that was misguided. By making the systemic causes of poverty and exploitation imperceptible and obscuring the fact that real justice requires a radical redistribution of corporate profits, the purpose paradigm derails and delays progress. As a self-serving corporate fantasy, the purpose paradigm is designed to win trust that isn’t earned, perpetuate power that is not legitimate, and preserve a lack of governmental oversight under which corporations compete with each other for profits. Through college campuses, UN agencies, NGOs, corporate foundations, and aid organizations, the purpose paradigm has taken on a life, logic, and even an economy of its own. But now, the emergence of “Purpose Officers” suggests that the real threat to the bottom line is seen as the dissent that comes from within. Ultimately, CEOs like Paul Polman understand perfectly that it’s their own workers—and their ability to define and “embed” purpose on their own terms—that they should be most scared of. Maria HengeveldTwitterMaria Hengeveld investigates and writes about feminism, globalization, and workers’ rights. She's a PhD student and Gates Scholar at the University of Cambridge and a contributing editor at Africa is a Country.